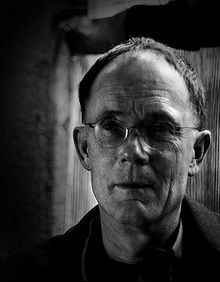 William Ford Gibson (born March 17, 1948) is an American-Canadian speculative fiction writer and essayist widely credited with pioneering the science fiction subgenre known as cyberpunk. Beginning his writing career in the late 1970s, his early works were noir, near-future stories that explored the effects of technology, cybernetics, and computer networks on humans—a "combination of lowlife and high tech"—and helped to create an iconography for the information age before the ubiquity of the Internet in the 1990s. Gibson notably coined the term "cyberspace" in his short story "Burning Chrome" (1982) and later popularized the concept in his acclaimed debut novel Neuromancer (1984). These early works have been credited with "renovating" science fiction literature after it had fallen largely into insignificance in the 1970s. I grew up in southwestern Virginia. I was born in South Carolina, but only because my parents had a vacation cabin or something there on the beach. I was like a summer baby. But I did grow up in the South. I grew up in serious, serious Appalachia, in a very small town. If I'm practicing making up what the characters will do, it's never good. In fact, when I catch myself doing that, I try to get rid of that section, and try and let them start making the decisions. Whenever I read a contemporary literary novel that describes the world we're living in, I wait for the science fiction tools to come out. Because they have to - the material demands it. I guess Twitter is the first thing that has been attractive to me as social media. I never felt the least draw to Facebook or MySpace. I've been involved anonymously in some tiny listservs, mainly in my ceaseless quest for random novelty, and sometimes while doing something that more closely resembles research. I would like to design what people generally call streetwear. I'd like to dress skateboarders, or whatever the older equivalent of skateboarders are. I pay more attention to that stuff than anyone would ever imagine because I'm watching what the designers do. I'm interested in how people all over the world array themselves and go forth in the morning to do whatever they have to do to make a living. I like the idea of people who've had some success in one form secretly wanting to be something else; I have some of that myself. I look for it in other people who've established themselves in some particular art form, and then you find out that they really would like to design running shoes, or edit literary magazines or something. I find it interesting to see people - mostly people who are younger than I am - going to considerable trouble to try to reproduce things from an era that was far more physical, from a less virtual day.